If you haven't heard, James Cameron's upcoming sci-fi epic, Avatar, is a movie that is being filmed in photo-realistic, "stereoscopic 3D," which mixes live-action and CGI imagery in a seamless blend. Avatar will reportedly be 60% CGI imagery, with a majority of the CG character animation filmed with revolutionary new motion-capture techniques using live actors. The other 40% of film will be live-action imagery, relying on more traditional (but no less spectacular) Cameron-brand visual F/X. The live action sequences were shot on location in New Zealand last Fall/Winter, using the same Fusion 3-D camera system that Cameron helped pioneer for his IMAX feature Ghost of the Abyss in 2003, and which has gone on to make live-action digital 3D fare like Journey to the Center of the Earth possible (much to our shared regret). To bring his CG characters to life in the most realistic sense, Cameron has reportedly redefined the way motion capture (or "performance capture") sequences are filmed. His actors wear special bodysuits and head rigs equipped with a standard definition camera that takes constant images of their faces. That data is then transmitted to another camera creating a real-time image of the live actor "wearing" their CGI costume. "The way we developed the performance capture workflow on 'Avatar' is we have our virtual camera, which allows me to, in real time, hold a camera -- it's really a monitor -- in my hands and point it at the actors and see them as their CG characters," Cameron said... "It's this amazing ability to quickly conjure scenes and images and great fantasyscapes that is very visual...When you are doing performance capture, creatively it's very daunting. It's very hard to imagine what it will look like. But if you can see it, if you can have a virtual image of what is it going to be like, then you are there." Another new motion capture technique being employed by Avatar is what Cameron and company call "Facial Performance Replacement" (FPR). Basically, FPR allows Cameron to digitally re-work an actor's facial movements. Lines of dialogue that get changed after principal photography on a scene can still be seamlessly implemented into the finished scene, without the actors having to re-don their body suits and head rigs for another take. For Avatar, Cameron wants to further blur the line between live-action imagery and CGI imagery. To that end, he's come up with something called "Simulcam"--a revolutionary new camera able to superimpose CGI images, over live images being filmed in real-time. "We turned the set on the soundstage into a capture volume and turned the physical camera into a capture virtual camera, so we were able to integrate CG characters and environments into our live action." [Cameron said...] "We have people in flying vehicles, and I can see what is outside the window, fed in, in real time." Wow, just imagine: movies where the interplay between what is real and what is digital is virtually indistinguishable; CGI environments that truly feel "alive," rather than hollow, empty, green-screen stages with live actors running around trying in vain to act like they're immersed in some fantastic world (*cough* Star Wars prequels *cough*). "The real question is "Where does all this go?" Cameron said. "Are we looking at a situation maybe 10-15 years out where most laptops are sold with 3D stereoscopic screens, most monitors are stereo compatible, most DVD players can run stereo content? ... I can see this becoming much more pervasive that we are thinking now." Does this new tech make you just a tad more interested in Avatar? Or do you need to see that first trailer drop before the you'll start getting as jittery and excited as me? 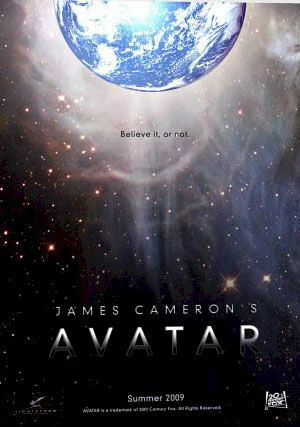 Avatar is slated for a December 18, 2009 release. It's being directed by James Cameron (duh).